PETALING JAYA: Real estate investment trusts (REITs), which focus on higher-than-market average yields, will stand out in the current uncertain economic and market environment due to their defensive qualities. The impending listing of IGB REIT and KLCC Property Holdings Bhd's planned REIT could potentially raise investor attention to a sector otherwise viewed as a low-beta proxy to the economy. 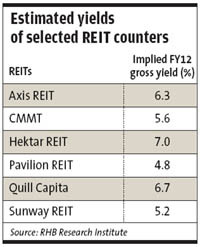 Analysts contacted by StarBiz said they did not discount the possibility of eventual increased attention on REITs, saying that this could be a prelude to a re-rating for the sector. “These two REITs are huge in terms of potential flotation volume and market capitalisation. For IGB REIT, its asset valuation of RM4.6bil will make it the largest retail REIT to date,” RHB Research Institute's REIT analyst Loong Kok Wen said over the telephone. Loong said the huge asset base due to high liquidity in the financial system would also attract the attention of institutional investors. “This is a good opportunity to buy into such initial public offering REITs amid the sustained global uncertainties,” he added. Loong noted that interest in REITs was currently high and this could be sustained, moving forward, should global uncertainties persist. “There has been a lot of attention lately on consumer-based dividend-paying stocks and their prices have been going up. “It is the same for REITs their asset revaluation had seen increased prices on the backdrop of high liquidity in the economic system,” Loong added. A property analyst with TA Research said the other qualities of REITs that would be appreciated by investors in these volatile times were their dividend yielding nature compared with other fixed-income securities. “I am positive about retail REITs as their dividends are stable because these cash stream comes from their rents. “Retailers are resilient amid booming economies in the East. And locally, consumers here are always shopping and buying goods during the weekends,” the analyst said. However, the analyst noted that while REIT yields had declined slightly from the past, one could still find yields as high as 8%. Yields today still offer 2%-3% premium over fixed-deposit (FD) rates. “For example, if I am a person with a lot of money, I would like to diversify my returns and risk. So REIT is the next best alternative after FD. “Today, we are also looking at richer valuations for REIT stocks,” the analyst said. In a report, Hong Leong Investment Bank said foreign funds and investors were continuing to show strong interest in Malaysian retail assets due to their attractive yields and pricing. “The retail segment is blessed with a highly favourable macroeconomic backdrop sustained consumption theme in Malaysia, rising disposable income and discretionary spending, high consumer confidence, strong employment market (and) the tourism boom of Malaysia,” Hong Leong's REIT analyst Sean Lim wrote in the report.